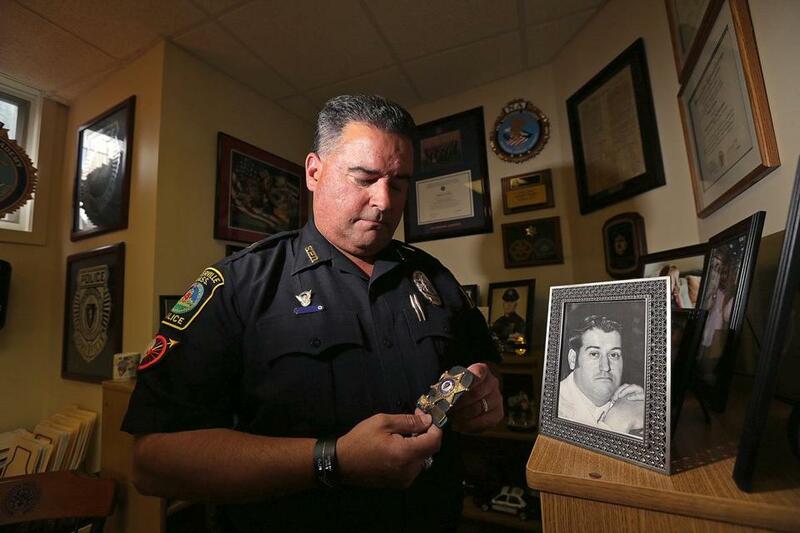 Somerville Police Captain Mike Cabral’s father, Joe Cabral, died by suicide. A new state website aims to get help to the demographic with the highest suicide rate: middle-aged men. The website, called MassMen.org, has three buttons: a mental health screening, a directory of local suicide prevention organizations, and ManTherapy, a tongue-in-cheek take on virtual counseling. Launched in March, the site is part of a statewide initiative to curb the increasing number of suicides by middle-aged men in Massachusetts in recent years. Services on the website are free and allow for users to remain anonymous, said Alan Holmlund, director of the state Department of Public Health’s suicide prevention program, and so far, men have been receptive to it. “Our goal is reach out to a group of men that no one has come up with a good way to reach,” he said. The number of suicides has steadily gone up in the state, driven by increasing rates among middle-aged men, according to a report released last winter from the Massachusetts Violent Death Reporting System. Men ages 45 to 54 had the highest rate of suicide of any demographic group in 2012, the report found. Men’s suicide rates exceeded women’s by a ratio of 3 to 1, according to the report. Men typically use more lethal means to kill themselves, such as by hanging or with a firearm, compared with women who typically opt for poisoning or drug overdoses, said Holmlund. Compounding the challenge, men are less likely to reach out for help or counseling than women. “We’re constantly asking ourselves, ‘How are we not meeting their needs? What can we do better from a message standpoint to get to these individuals,’ ” said Candice Porter, executive director of Screening for Mental Health, Inc. , a Wellesley-based organization offering mental health assessments that created MassMen.org with state Department of Public Health funding. The key to MassMen.org’s success is its anonymity, as many middle-aged men attach a stigma to seeking help, said Doreen Marshall, senior director of education and prevention at the American Foundation for Suicide Prevention. People who look up traditional health resources on the Internet do not always act on the information, Marshall said. By presenting the suicide prevention message in alternative formats, like video testimonials, MassMen.org may be successful in encouraging its users to take the next steps toward help, she said. “Having models of people like them talking openly about a mental health concern can really be powerful in terms of motivating them to seek help on their own,” said Marshall. Health officials are launching a statewide billboard campaign and radio advertisements to promote the MassMen.org prevention resources, Porter said. Officials are also addressing some of the specific factors leading to the increase in suicides in recent years among middle-aged men, including external ones like job troubles or foreclosures following the Great Recession, she said. Some occupations, including largely male-dominated jobs in law enforcement and construction, have higher suicide risks, according to a study by National Institute for Occupational Safety and Health. The National Action Alliance for Suicide Prevention Workplace Taskforce has developed a screening for workplace suicide prevention among law enforcement officers and has produced a video geared toward police departments to show them how to make suicide prevention a health and safety priority, Porter said. “For us, it’s about breaking the silence. It’s about really bringing the conversation to the forefront and having these folks realize they can seek help,” she said. Among Middlesex County correction officers, a peer support team of volunteer officers has been a widely used prevention method, said Middlesex County Sheriff Peter J. Koutoujian. Men are more likely to share their struggles with their friends than a professional, said Holmlund. “Even before we formalized the program, people were connecting with this team. We had to eventually add more officers to it,” Koutoujian said, who has also implemented a series of conferences, trainings, and resources to address the issue of mental health among his ranks. At one of those conferences, Mike Cabral, a captain for the Somerville Police Department, spoke up, said Koutoujian. Cabral’s father, Americo, was a correction officer who took his life in 1991 at the age of 55. Americo Cabral failed to pass a work qualification test, came home, told his wife to tell their children he loved them, and then shot himself at a local baseball field. Cabral, who was 29 at the time, found his father’s body there, he said. Cabral’s father feared being reassigned to a shift where he would be working directly with inmates instead of with families, said Cabral. On top of that, he had a heart problem and worried about money. “He had a loving family. He had grandchildren. He had a lot of live for,” said Cabral.